When the Civil War ended in 1865, Americans found themselves with more wealth and economic power than they'd ever had before. Seemingly overnight, a new emphasis was placed on materialism and leisure time, and this led the country's elite to seek destinations where they could relax and escape the bustle of a newly booming society. Coincidentally, transportation improved by leaps and bounds around the same time, so remote destinations became easily accessible by steamboat and train. This perfect combination of physical, economic, and social infrastructure led to the popularization of a new phenomenon: resort hotels. 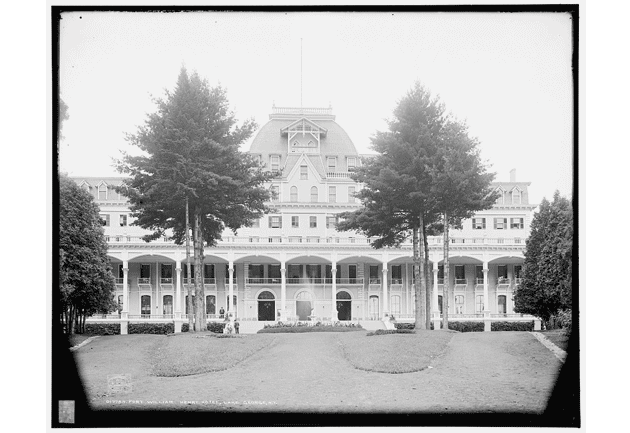 Sprawling resort hotels began popping up in many locations throughout the United States, but the Adirondacks was a particularly desirable destination, due to the region's proximity to the wealth of New York City. These institutions provided much more than just a place for guests to sleep, and were often viewed as their own self-contained worlds. They commonly boasted top-of-the-line conveniences, like sanitation systems, fireplaces, gas and/or electric lights, telegraph systems, running water, and more. These amenities had yet to become mainstream in American homes, so escaping to resort hotels felt like taking a step into the future. By the 1880s, a strong focus had been placed on physical health and wellness, which included sports and recreation. Resort hotels adapted accordingly, incorporating a variety of outdoor and indoor activities, and even competitive sports into their offerings. Adirondack resort hotels, in particular, rose in popularity during this time due to their close proximity to lakes, streams, mountains, and other locations that lent themselves well to the activities guests were seeking. Resort hotels enjoyed an extended period of prosperity, but began their demise in the 20th century. As many were built out of wood and constructed hastily to take advantage of the popularity at the time, they were particularly susceptible to fire, and many went up in flames. Those that didn't burn sometimes needed to be destroyed due to advanced levels of wear and subsequent safety concerns. Some owners couldn't afford to make the upgrades that were necessary over time, and their facilities fell into disrepair. To cover the ever-increasing costs of operation, some resort hotels boosted their prices so much that even the elite could no longer afford to vacation there. Perhaps the most troubling factor of all that led to the end of the resort hotel era was the fact that the socialites moved on and became interested in spending their leisure time doing other things. Without their interest, resort hotels had no clientele. During the height of their popularity at the end of the 19th century, there were almost 200 resort hotels in the Adirondacks; by 1950 only four that had been built before World War II remained. Below are brief descriptions of some of the most famous Adirondack resort hotels that were architectural rarities in their prime. Reading about them provides a clear picture of their desirability at the time, and proves just how central of a role they played in post-Civil War America. View from the Fort William Henry Hotel, Lake George, N.Y.
Hotel Champlain, front facade, Bluff Point, N.Y.
Stevens House, Lake Placid, Adirondack Mts., N.Y.
Sagamore Hotel, Lake George, N.Y.
Tolles, Jr., Bryant F. "Resort Hotels of the Adirondacks: The Architecture of a Summer Paradise, 1850-1950"